For one vet, working through one of the deadliest viruses known to man is no deterrent to saving dogs. When the stability of your country is under the threat of the Ebola virus, unfortunately international animal welfare can take a back seat, but despite being one of the very few vets in Sierra Leone, Dr Gudush Jalloh is dedicating himself to the welfare of dogs in the country. Leading up to, and during the outbreak, Dr Jalloh has relied on the Worldwide Veterinary Service (WVS) supporting his work by sending him vet supplies that are essential in helping him continue to serve the needs of animals in Sierra Leone at a time when most might have abandoned the country and animals in need. As news reports give grave numbers of the human toll of the Ebola virus in West Africa, (an estimated 7,388 deaths according to the World Health Organization) Dr Jalloh, pictured centre below, continues tirelessly working with abandoned animals through his organisation, SLAWS or Sierra Leone Animal Welfare Society, located in the capital, Freetown. Dr Jalloh's family were traditionally nomadic cattle herders of the Fula tribe, but he trained to become a vet in Moscow. It was when his brother died after being bitten by a rabid dog that a young Gudush Jalloh was determined to become a vet. He now lives and works in the capital city, Freetown where he has started a vaccination programme to keep the population of stray dogs under control. But since the outbreak of Ebola in March 2014 working has become extremely difficult under quarantined areas, mass panic, and the risk of infection. He told us; "This (the virus) has resulted in serious socio-economic break down. Most activities have halted, the medical system is not working well. People are dying not only as result of Ebola but also from other treatable health problems due to lack of attention. People are afraid of reporting illness as so not to be identified as infected, as there are similar signs and symptoms to other diseases." But the impact on animals is also critical. As a vet he is fighting against misinformation that dogs are transmitting the disease. As a result to this dogs are being slaughtered. In the climate of fear, the dogs of a village nurse who was diagnosed with the disease were all butchered. People are resorting to killing scores of dogs to prevent transmission of the virus by the dog. Due to the panic, dogs are being left to roam and are not being quarantined as they previously were. There are a huge number of stray street dogs in Sierra Leone, around 250 000. This is creating a wider knock-on effect with rising rabies reports. Infected dog bites can be fatal to humans without the right treatments. Previously WVS was able to assist Dr Jalloh with rabies vaccinations, treating stray dogs in outreach clinics before the outbreak in March. Now WVS continue to supply him with parcels of antibiotics, surgical gloves, syringes and bandages amongst other life saving supplies. "We are also worried about a massive rabies outbreak. And in this situation all animals are affected indirectly or directly. We are trying to get to communities talking to people. The situation is slowly getting better, but it is very unpredictable, one day seems good then the other seems bad. We can’t do a lot of traveling, as there are restrictions on travelling if you have to move you must have a pass." We asked Dr Jalloh if it was hard to make people care about animals in the current situation, he replied: "It is very difficult because when the human situation is compromised. The good thing about this country over the years of work is the perception is changing. There are a lot of organisations helping the human side, but there are no animal organisations on the ground here." Kate Shervell, a vet and International Director of WVS project 'Mission Rabies', visited Sierra Leone last year. Kate, pictured below, says, “I volunteered with Dr Jalloh’s organisation, SLAWS, in November 2013, before the Ebola crisis hit the following year. Freetown is a heavily populated city with a big dog population. 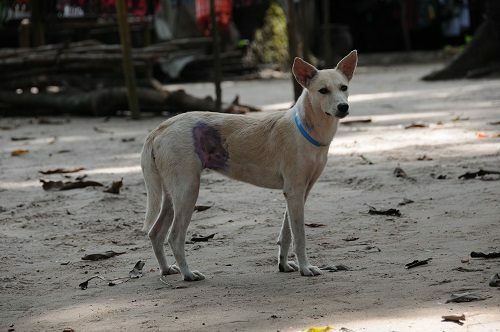 According to Dr Jalloh, the dog population boomed there as a result of the civil war, when people from rural areas came to seek safety in the city, bringing their dogs with them, who then established themselves and their offspring remained in the city, even when the people returned to their villages. Dr Jalloh is very much alone in the battle to control rabies and improve the welfare of the animal population of Freetown – his clinic employs a number of paravets and animal carers, but he is the only qualified vet there and one of only a handful of vets in Sierra Leone. Whilst I was there I worked with the team both in the clinic, where the animals were brought in a steady stream throughout the day for treatment, and also sterilised and vaccinated dogs on surgical outreach clinics, using the charity’s mobile vet hospital truck. At these outreach clinics, I was surprised at how far people had walked to bring dogs for sterilisation – one young boy spent the whole day walking back and forward between his home, bringing each of his 5 puppies and adult dog, named ‘Good Friend’, for sterilisation and vaccination. The demand for the service Dr Jalloh and the SLAWS staff provides is so high, but their resources and capacity are limited, so it feels like an insurmountable problem at times. One of the main challenges that the team face is the lack of infrastructure – the roads are battered by huge mining vehicles from Chinese-run companies, going back and forward each day, making it impossible for the vet hospital vehicle to reach many of the villages along the Freetown peninsula. Electricity is also sporadic – sometimes power outages would last days, making web-based promotion and fundraising for the charity almost impossible. ATM machines invariably don’t work, so the society functions entirely on cash – the largest note being worth £1.60, so you feel like a bank robber each time you make a withdrawal over the counter! Getting hold of basic veterinary supplies is a challenge – many drugs simply aren’t available. Remembering the struggle that veterinary and medical professionals faced in Sierra Leone before the Ebola outbreak, it is difficult to imagine the situation now. Dr Jalloh has told me that the pressure on the already-overloaded healthcare service due to Ebola has completely overwhelmed it and that other diseases, such as malaria, TB and rabies are now claiming more lives than ever before. Fear of Ebola has led people to kill dogs – even more so after the dog belonging to the Spanish Ebola sufferer was euthanased, last year. Dr Jalloh is keeping the work going at SLAWS, despite the challenges, and, although they cannot currently go into the communities doing the rabies prevention work they did before, as soon as the threat of Ebola lifts, they will be prepared to commence this work again." Find out more about Dr Jalloh and the Sierra Leone Animal Welfare Society by visiting www.slaws.org. WVS provide animal welfare charities all over the world with a sustainable veterinary resource, providing vital aid, which would otherwise not be available. We need your help to keep helping animal welfare heroes like Dr Jalloh. The need for your support is greater then ever. We have a constant demand for veterinary supplies, from treatments and dressings to surgical equipment. Find out if you have equipment which can be donated here or get involved, donate and offer support by visiting here and make a difference.